The Boss® FA-1 is a preamp/EQ pedal produced in the early 80s whose main claim to fame is supposedly as part of The Edge's rig. This, and the relative unavailability of it's active components (the FET and inline opamp) tends to make it one of those pedals that attracts prices far out of proportion to it's worth. However, this also makes the FA-1 a good target for a high-quality, reasonable-cost, no-BS reproduction. Enter the Sweet FA! Firstly - those 'special' active components. As with most production engineering, the choice of parts at that time was for those that were readily available. There's no special mojo here - just a simple and effective FET buffer followed by a switchable high-pass (low-cut) filter, volume control and active two-band tone control. Appropriate, reasonably-priced and readily-available substitutions for the FET and dual-opamp have been selected, and this results in the same functionality, same tone but improved noise levels at a lower price for you. Also important is the addition of a footswitch with LED indicator and external DC jack - the original had none of these, making it a slightly awkward fit into some modern rigs. 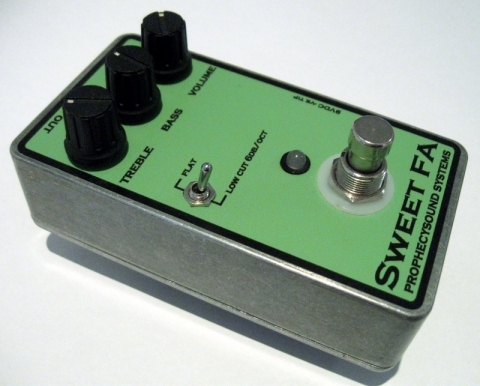 If you are looking for a clean boost with plenty of gain, a bright and crispy sound and flexible EQ options, you should consider the Sweet FA!